B., Kemala (2001) Hubungan antara motivasi berprestasi dan kecemasan terhadap tes dengan prestasi belajar. Skripsi thesis, Universitas Tarumanagara. "This research was focused to the learning achievement of the student of Psychology Faculty of Tarumanagara University. There are many factors influent one's learning achievement. This research is focused only to the factors that influence achievement motivation and the anxiety for test. Achievement motivation is a motive to do something as good as possible to achieve a success or superiority as a result from his or her own effort. Meanwhile, the meaning of the anxiety for test is the feeling of fear, worry, anxiety followed by physiological and osychological changes, which occurred to someone while having a test. The Subjects in this research were 55 students. They were the students in Psychology Tarumanagara University who attendent the course of Psychometry. All subjects were asked to fill questionoures. The questioner in the given quistioner were in form off Continum Scale (SS-S- AS-TS-STS). The data process in this research used Pearson Correlation Technique and assisted by SPSS Program for Windows release 10.0. From the result of this research, there were negative correlation between Motivation of Achievement and the Anxiety for Test (r= 2,225), negative correlation between the Anxiety for Test and Learning Achievement (r= 2228) and positive correlation between Motivation of Achievement and Learning achievement (r = - 0,269). 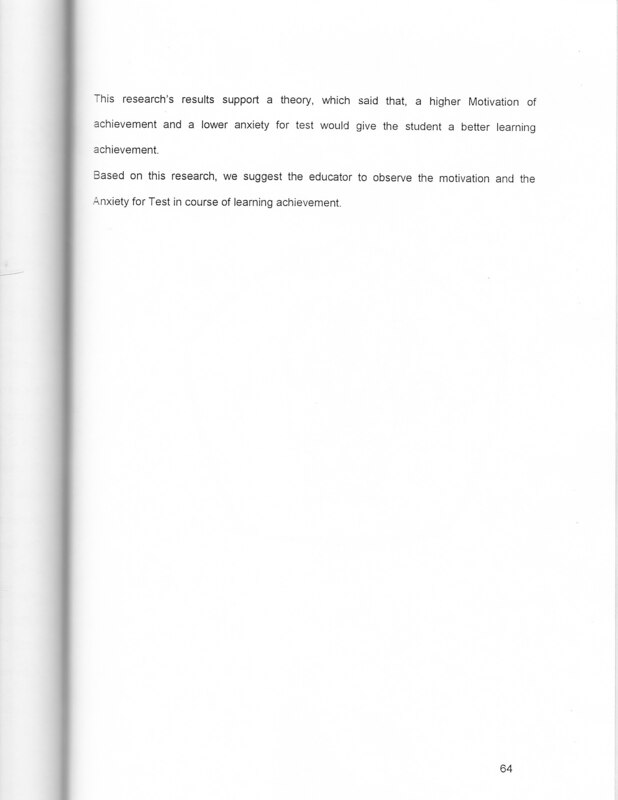 The research results support a theory, which said that, a higher Motivation of achievement and a lower anxiety for test would givie the student a better learning achievement Based on this research, we suggest the educaor to observe the motivation and the anxiety for test in course of learning achievement "